Almost every song ever created has a chord progression. That is – a series of chords played in a particular order. A song without a chord progression would need to be comprised of solely a melody or beat. However, for the majority of songs that exist, chord progressions are extremely important. 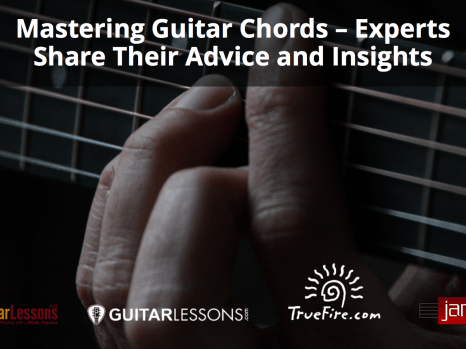 However, if you’re a guitarist, how do you know what makes good sounding guitar chord progressions? Is there a particular formula that musicians use in various styles of music? And how do you transition from a verse progression to the chorus? In this post, we’re going to be answering those questions and more as we begin to demystify the magic behind chord progressions. What Makes a Good Chord Progression? What makes a good chord progression is somewhat of a multi-answer question. There are predictable patterns we can use to create a nice sounding chord progression, however, it is not necessary to follow these patterns exactly to create something that sounds great. A great analogy for what makes a good chord progression is explained by the folks over at secretsofsongwriting who compare a nice sounding progression to a jog. When you first set out for a jog you begin at home; this is known as your tonic or root. Once you get to the end of your run (a location far away from your starting point) you’ll want to begin making your way back home. However, your final destination may not always be known; therefore it is that jump from the root note to the “final destination note” that will give listeners that sense of unpredictability. On the other hand, The run back home, in terms of music, is what gives users that sense of predictability. There are certain paths you should be familiar with and know they will bring you back to where you need to be. To put what was just explained into a bit more perspective, check out the numbered list below. We first start off with the root note (position 1), then jump to the ultimate harmonic (position 4) then make our way back home via the pre-dominant (position 3), dominant (position 4), and then back to the root note (position 1). I – iii – IV – V – I. C – Em – F – G – C.
As you’ll see below, this certainly isn’t the only way to make nice sounding guitar chord progressions. However, it is one method that you can think about and use. You may have also heard of this same type of concept referred to as tension and relief. The further away you get from”home” the more tension is created. Once you return “home” you experience that sense of relief. However, although it works well in some instances, following a predictable path doesn’t leave the listener guessing what’s going to come next, they already know. That’s why isn’t important to sometimes add chords to your progression that aren’t necessarily within your chosen key or move a little off the beaten path. A great concept to learn more on regarding chord progressions is the difference between strong vs fragile progressions. Although one is not necessarily “better” than the other, they both serve their own purposes. The below video provides a great introduction to this. There are tons of chord progression variations that have been created even just so in the past century. 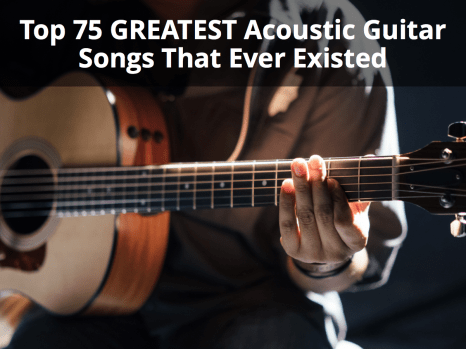 Listing out all chord progressions would take forever and the list would be so long that most people would not even bother going through it all. That’s why I’ve decided to feature some of the most popular guitar chord progressions in the section below. 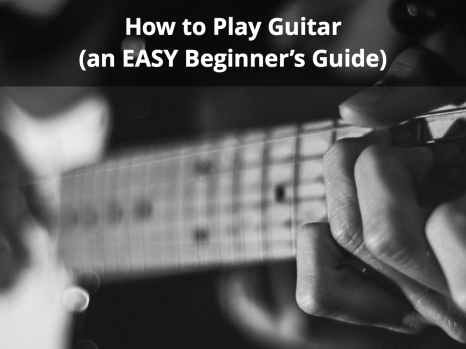 To completely understand this section I recommend first taking a read through the learning guitar scales and beginner guitar chords posts. 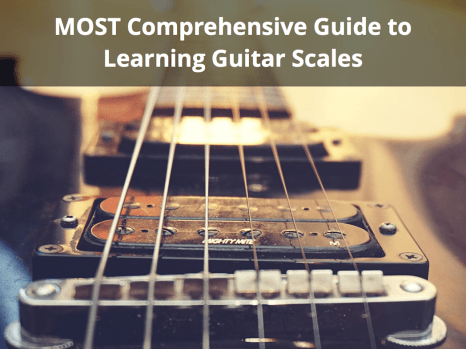 You’ll need to know a little bit about scale degrees and what each degree corresponds to in terms of major / minor chords. A basic progression that is used in a ton of popular songs of all different genres is comprised of the 3 major chords within a key. These three chords correspond to the following scale degrees: I – IV – V.
Therefore, if you were in the key of C, the progression above would be C – F – G. With this progression, you can use a single chord more than once or you can even choose to not use all three. For example, you could play a progression such as I – IV – V – I like the song “Lay Down Sally” by Eric Clapton or I – IV like the song “Imagine” by John Lennon. 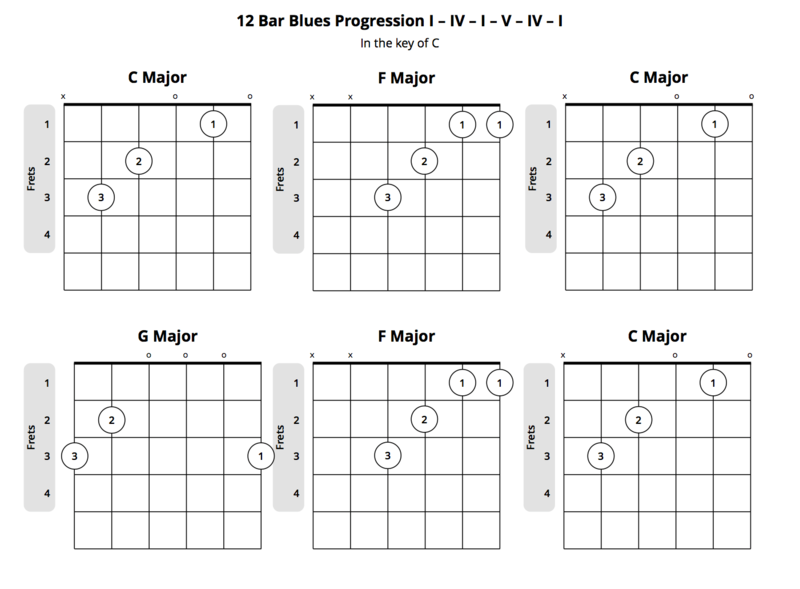 The 12 bar blues progression is obviously a guitar chord progression most often used in blues music. It also makes use of the 3 major chords within a Key, however does so in somewhat of a specific order: I (x4) – IV (x2) – I (x2) – V (x1) – IV (x1) – I (x2). In the key of C, the chords that would correspond to a basic blues progression are shown above. However, many blues songs do modify the number of measures spent on a particular chord and sometimes skip a chord entirely to play another for a longer period of time. The above formula is just a basic example of a 12 bar blues progression. An example of a song that uses this progression is “Pride and Joy” by Stevie Ray Vaughan. This chord progression ventures a little bit outside of just using the three major chords of a key and incorporates the sixth degree of the scale. Since it is the sixth degree, this corresponds to a minor chord (check the note above to see why): I – VI – IV – V.
If we were in the key of C again, for example, the chords that this formula would correspond to would be C – Am – F – G. This progression can be heard in the song “The Book of Love” by The Monotones. You can also replace the IV in this progression with a II. This pop progression has been used time and time again in well, pop music. It is somewhat similar to the 50’s progression in that it uses all of the same chords however the order in which they are played is different: I – V – VI – IV. This progression in the key of C would correspond to C – G – Am – F. A couple of songs that follow this progression are “With or Without You” by U2 and “Don’t Stop Believin’” by Journey. Check out the Axis of Awesome skit where they play a bunch of pop songs using only 4 chords and this progression. This progression is a little less commonly used, however, is very popular in Jazz compositions. It is different from the others as it actually doesn’t start with the tonic, but rather with the minor chord at the second degree of the scale: II – V – I. In the key of C, this progression would correspond to Dm – G – C. You can hear this progression being used in the song “Satin Doll“. To learn more about this progression check out this detailed Wikipedia article. Now that you’re more familiar with a few chord progressions, you might be asking yourself “okay so how do I transition from my verse to a chorus now?”. Well, as with most things in music there is no one right answer. However, there are various techniques you can use to transition from your verse progression to your chorus progression. Here are a few examples. Using the relative minor – You can make use of the relative minors of each chord to find chord substitutions for your verse and chord. For instance, let’s say we’re using a basic guitar chord progression in the key of C which is C – F – G – C. Then, if we want to make a chorus, we can use the relative minor while maintaining the same progression. You can easily visualize the relative minor of each chord using a circle of fifths diagram. In this example, that would correspond to Am – Dm – Em – Am. Let’s take another example but this time we’ll use the key of A. You might also consider adding a couple of chords for your transition back from the chorus to the verse. For example, in the key of C you might play the pre-dominant (F major) and dominant (G major) before going back to the C. I recommend checking out The Chord Wheel book on Amazon for a complete guide about the circle of fifths. Changing the key – The next technique you can use to transition from verse to chorus is to just simply change the key of the song, while keeping the same chord progression. For this method, we’re going to use the exact same progression both in the verse and chorus but just modify the key. So, let’s say we’re in the key of C and play the same progression as above, C – F – G – C. For the chorus we can change the key to F and therefore play the chords F – A# – C – F.
Modifying the rhythmic quality – You can also try keeping the exact same chord progression and key for both the verse and chorus. The only thing you need to change using this method is the rhythmic structure of the song. For example, in the verse where you might have played one chord for 2 measures, try playing it for 1 in the chorus. You can also try playing the progression in double time. Additionally, you can try playing around with variations of the melody (i.e. vocals) in the chorus to help give the song some separation between the verse and chorus sections. Check out this Berklee music college video which explains how to use this method in more detail. There are many other techniques you can use to transition from your verse to a chorus, these suggestions above are certainly not the only methods. Try experimenting with different techniques. The next time you’re listening to a song, try to understand what is going on when they move from playing the verse into the chorus. Focus on the rhythm, melody, key, etc. 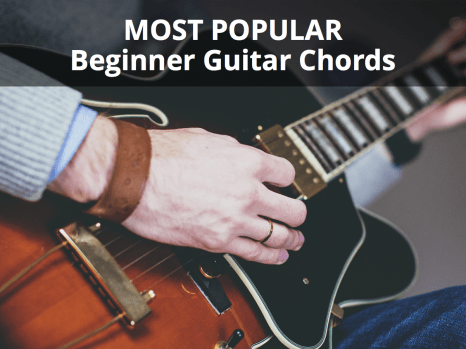 There are a few chord progression tools out there that you can use to generate random guitar chord progressions and even find songs that use a specific chord progression. Check out the three tools below and try using them as you learn more about chord progression theory. Progression Generator – This guitar chord progression generator is pretty interesting as it allows you to specify multiple characteristics before it generates a progression for you. For example, you can specify the genre, mood, key and speed. Once you do that, press “Go” and it will generate a main progression as well as a couple of chorus options. You can also hit the play button to get a preview of what each progression sounds like. Autochords – This tool also allows you to generate random chord progressions and comes with various options that you can specify such as the mood, key, instrument, and major / minor. If you don’t want to produce any sound in specific, you can also just click the “Randomize” button and the tool will automatically set the options for you and generate a random chord progression as well as alternatives. Hooktheory – This last tool is a little different from the first two in that it doesn’t generate chord progressions for you but rather shows you a list of songs that use a progression you define. For example, let’s say you want to find a list of songs that use the progression C – F – G – Am. Plug that into this tool and it will fire out a list of songs that contain that progression of chords. It’s a great analytical tool if you want to discover which songs use which progressions. As you can see, there are various methods for creating great sounding guitar chord progressions. There are certain”formulas” you can use, however, you also shouldn’t be afraid to venture outside of these formulas and add something different that still works. What’s also an interesting topic regarding chord progressions is which chord you will choose to be the tonic. A study by hooktheory (creators of the chord progression analysis tool above) found that after analyzing 1300 songs, the most popular key turned out to be C.
Use this information as you wish. Choosing a particular key for your song certainly should not be based on what is popular but rather what mood you are aiming to achieve as well as which key better compliments the vocal or instrumental melody. Have any questions about guitar chord progressions or have a particular progression that you love and would like to share? Leave a comment in the section below!